After my speech today I had a conference call and then we were off to dinner. Now San Francisco can be surprisingly hilly -- especially China Town which was a stone's throw from the conference. The people here must be in great shape because you have so many sharp inclines to navigate. By the time we left to go eat we were all starved. One of my team members doesn’t really like seafood so it was a tough experience finding something we all could agree upon. San Francisco is just brimming with seafood options. It turns out that after walking up some big hills we ended up looking into a window full of sushi. No people but just sushi on little wooden boats floating around in a circle. Of course a double take was in order. Who would have expected to see something like this. Especially in China Town. It was unusual. It was bizarre. It required further investigation. The three of us entered the establishment once we determined that my colleague who prefers to avoid fish could find a satisfactory alternative to something that breathes through gills or has more than four legs. We decided to enter. 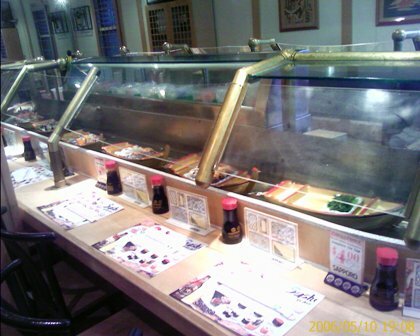 I couldn’t believe it – before my eyes were all the seaweed appetizers and California rolls you could imagine just quietly floating in a counter clockwise manner. I was forced of course to take pictures of this phenomenon. After all how often will I get to see something like this again I thought? We sat and I grabbed a seaweed appetizer and it was OK. Perhaps my reaction was to the fact that the seaweed was somewhat close if not exactly room temperature. 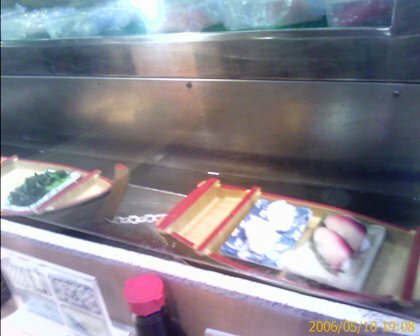 I was not thrilled to try the floating sushi that would also be at room temperature. Regardless, I was going to have sashimi so I had to order off the menu. The sashimi was good (and cold) but my colleagues and I were concerned that we were alone in the restaurant. I would prefer lots of customers and more fish being sold. After a while other people did come in which made us feel better. I am not sure the quality of the fish was outstanding but the atmosphere was certainly worth the trip. Apparently the chicken teriyaki was good. While I sat there waiting for my food I glanced at the chopstick wrapper and noticed the name of the establishment was Floating Boat Sushi Boat Restaurant. How could I have missed the opportunity to have checked this out? Yesterday we ended up in what seemed to be another China Town (how many of these can there be?) but this one was just south of the city by Monster/Candlestick Park. The restaurant was called Imperial Garden Seafood. The big thing in the restaurant was serving dim sum (Chinese appetizers) and no one spoke English – at least not to a level that we easily understood. I am pretty sure that someone offered us chicken feet and there were multiple dishes with live crabs. At least that is what the menu said. I had scallops which were great. There were many tanks of live seafood that I suppose you could pick from if you wanted. I felt like I was in China. It was a great experience and the food was wonderful. The only downside was the crummy neighborhood. The night before we went to Osha Thai Restaurant. The food was absolutely incredible and the kitchen served us in a flash. It was like fine dining with McDonalds speed and good service. The curry is a bit spicy but delicious. Today’s lunch btw was at Boudin Sour Dough restaurant and the salad was great. I didn’t have any bread but it looked amazing. What I love about San Francisco is the food and the people. I was pretty amazed at how friendly people were in the gym and everywhere else. The Aculab event seemed like a smashing success and two exhibitors told me the real VoIP action this week was in China Town not China. Some companies they said learned this the hard way. In all, I really like being in this city and wish I could stay longer. Many obligations – some happy and some sad take me back home.